Engraving, Anonymous, 23 x 20.2 L (Paris, Ed 3). Bartsch, XII, 1811, 59-60, under 17, as thought to be by Domenico del Barbiere. Robert-Dumesnil, VIII, 1850, 20, 7, as Boyvin after Rosso, with comment that some attribute it to Barbiere. Le Blanc, 1854-1890, I, 506, 7, as Boyvin after Rosso. Levron, 1941, 74, 164, as shop of Boyvin, after Rosso. COLLECTIONS: London, W3-122 (four corners missing and filled). New York, 49.95.196 (some repairs). Paris, Ba 12, p.6 (three smudges upper left); Ed 3 (two smudges upper left). Vienna, F.I.3, p.3, upper left, no. 4; It.III.3, p.46, bottom (repaired and redrawn at upper right so that the drapery behind Joseph is missing). Mariette, Abécédario, 1858-1859, 18, after Rosso, as depicting St. Elizabeth, and believed to be by Domenico del Barbiere. Weigel, 1865, 656, under no. 7732, as by Domenico del Barbiere, and as depicting St. Elizabeth. Zerner, 1969, XXXVII, is inclined because of the absence of a monogram to reject the attribution to Barbiere. Borea, 1980, 262-263, no. 676, 264, Fig. (Paris, Ba 12, not Ed 3 as stated), as Boyvin. Carroll, 1987, 44, 46, 360-362, no. 114, with Fig. (Paris, Ed 3). 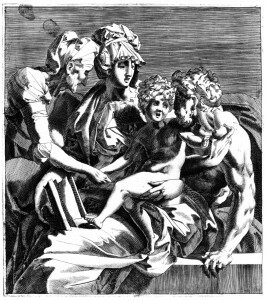 This engraving is probably based on Rosso’s lost drawing in the same direction known from a copy in Milan, and may well represent it more accurately than that copy. On the relation of the two, see D.82. 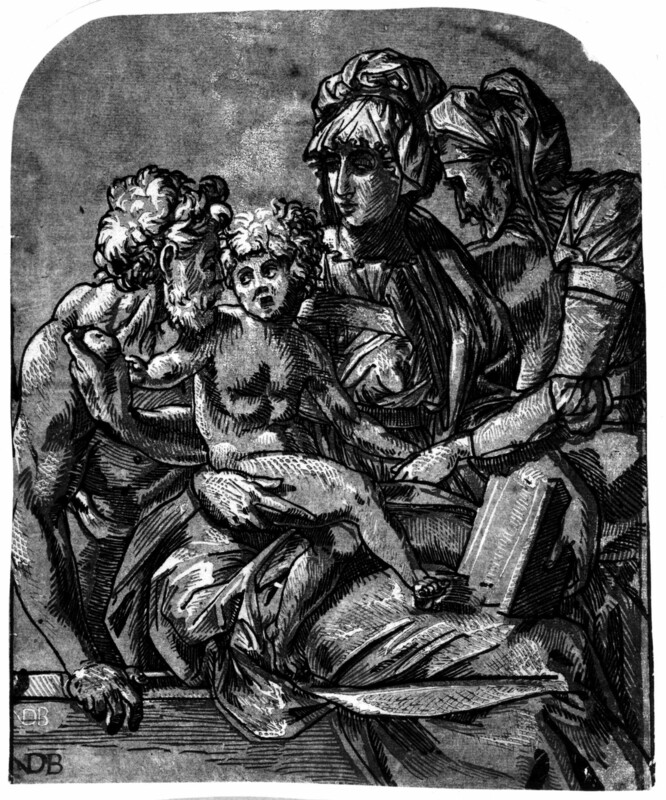 There is also a chiaroscuro woodcut of this image (Fig.E.101, I). 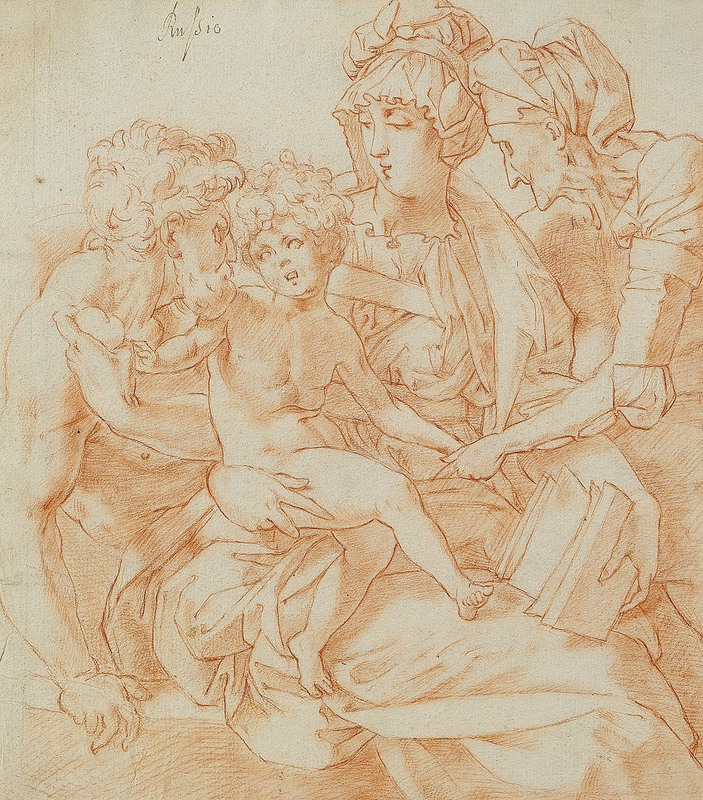 COPY, DRAWING: Milan, Chiara Veronese Collection (Fig.E.161, Copy, Drawing). Red chalk (over the slightest traces of black chalk? ), 21.5 x 20.2, inscribed in ink at the upper left: Rusio. The drawing is derived from the engraving, reversed to suggest that the print is based upon it. Very slight traces of black chalk, barely visible in a printout of an attachment to an email sent to me by Ms. Veronese on December 17, 2011. For Rosso’s use of black chalk, the copyist might have been served by the color plates in Carroll, 1987, such as the Judith and Holofernes in Los Angeles (no. 116), and the Empedocles-St. Roch (no. 109), too dark as they may be. The copyist further secured the correspondence of the engraving to his drawing by making them exactly the same size.